Earlier this week it was widely reported that the Department of Justice (DOJ) was planning “a new project to investigate and sue universities over affirmative action admissions policies they determine discriminate against white applicants.” A DOJ spokesperson denied the report, claiming that DOJ’s Civil Rights Division (CRD) was just looking for people “to investigate one administrative complaint” against one university in 2015. But that’s just not true. A closer look at an internal DOJ memo on the subject reveals that the Trump-Sessions DOJ is starting a politically-run project trying to undermine programs to promote diversity on our nation’s college campuses. The memo was technically an announcement of a “detail opportunity” for lawyers now working on other projects in CRD. How does the announcement contradict DOJ’s claims? First, the announcement says that the “detailees” will be temporarily assigned not to the part of CRD that ordinarily works on education issues, but instead directly to the immediate office of the Assistant Attorney General for Civil Rights, the political appointee that runs the entire Division. Second, the claim that the project will just “investigate one administrative complaint” is flatly contradicted by the text of the announcement itself. The announcement states that DOJ is looking for attorneys who will “work with” the CRD front office “on investigations,” not one investigation, as well as on “possible litigation.” Even the Trump-Sessions DOJ cannot magically transform that language to support its recent denial. Third, the rhetoric used in the announcement makes clear the target of these investigations and possible lawsuits: “intentional race-based discrimination in college and university admissions.” Let’s be clear, these are code words long used by right-wing advocates. They do not refer to discriminatory policies that exclude racial minorities, but to policies that seek to promote campus diversity by affirmatively and constitutionally using race as a factor in admissions decisions to help remedy the historical exclusion of racial minority students from colleges and universities. Just last year, the Supreme Court upheld the use of such carefully targeted programs to increase diversity in Fisher v. University of Texas at Austin. 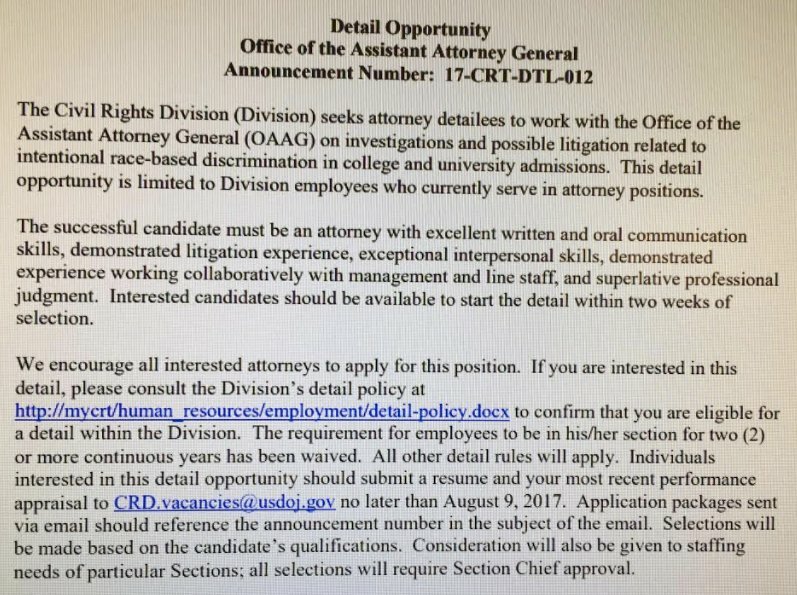 But based on the announcement and other sources inside DOJ, it’s clear that the DOJ project would be targeted at least in part at pro-diversity policies that they claim discriminate against white applicants. It is correct, as a DOJ spokesperson indicated, that a group calling itself the Asian American Coalition for Education filed a complaint with DOJ and the Education Department in 2015 claiming that Harvard was discriminating against Asian American applicants, which DOJ has not resolved. DOE dismissed the complaint it received because a lawsuit had been filed against Harvard raising similar claims, including an attack on a Harvard pro-diversity plan. It is certainly possible that the new DOJ project will look again at that issue, and perhaps decide to intervene in the court case or file a brief supporting the challenge to Harvard’s policies. But it is simply not credible to assert that the 2015 complaint will be the only matter to be dealt with by the new CRD initiative. What is much more likely is that this new project will look at a number of university policies to promote diversity, several of which are already under investigation or challenge by private groups, and seek opportunities to challenge them and further restrict—if not eliminate—policies to promote diversity in college admissions. After last year’s Supreme Court decision, right-wing advocates claimed that the ruling left “plenty of room for future challenges” to policies that promote diversity by taking race into account in admissions decisions. And with right-wing hopes that the key vote of Justice Kennedy in favor of policies promoting diversity in Fisher will be replaced by a Trump nominee as soon as next year, a future case could seek to overrule Fisher as well. The danger of the new anti-diversity project at DOJ is clear. At the very least, DOJ should tell the truth about it. Better yet, it should abandon the misguided idea and let CRD attorneys continue working to promote, not set back, civil rights progress. Elliot Mincberg is a senior fellow at People For the American Way.